Nearly everyone has heard and romanticized the tale of Robin Hood, who stole from the tyrannical, corrupt nobility to give back to the poor. Few stop and think, however, about how others may have played a part in this story. Ordinary merchants, whose livelihood depended on delivering goods to towns governed by the very same villains and enemies of Robin Hood. Merchants who worked hard to bring more food to the starving townsfolk. Merchants who sometimes risked their lives to smuggle in weapons and contraband for the people. Not without making a profit, of course. Everyone must make a living somehow. In the game Sheriff of Nottingham, you get to play as one of these calculating traders to see just how good you might’ve been at that life. Sheriff of Nottingham is a game of deception and calculation, not entirely unlike a game of Poker. 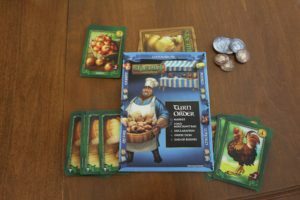 Players spend the majority of their time competing to make the most money by bringing goods into the town of Nottingham. 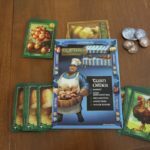 Some of these goods aren’t quite legal, and anything brought in must be cleared by the town’s Sheriff, who is represented by a different player each turn. Get caught smuggling illicit goods, and you will have to pay a fine. If you’re honest and have been needlessly harassed, you’ll receive compensation. 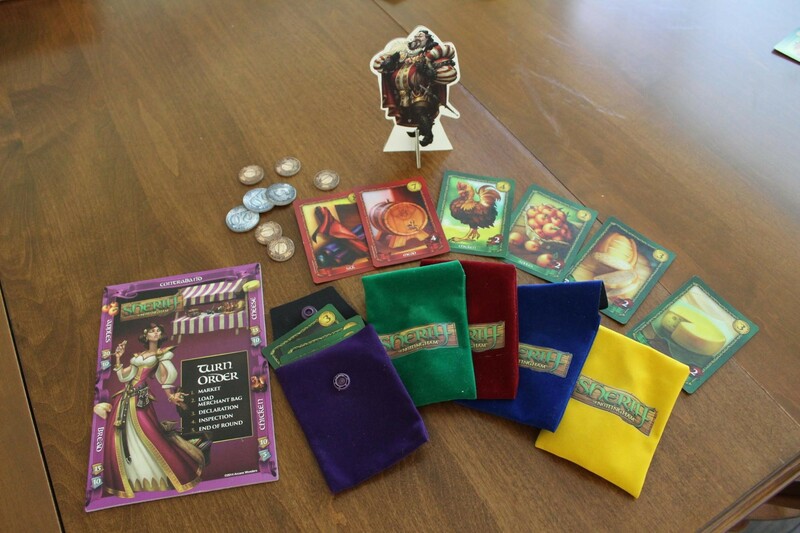 The game begins with everybody starting with six goods cards and 50 gold, as well as their merchant bag and scorecard. One player will be designated to start the game as a Sheriff. The rest of the goods are split into two separate decks face-down, of which then five cards are turned over into two discard piles. These piles represent the market. A turn consists of five distinct phases. The Sheriff participates in the final 2 (besides observing). 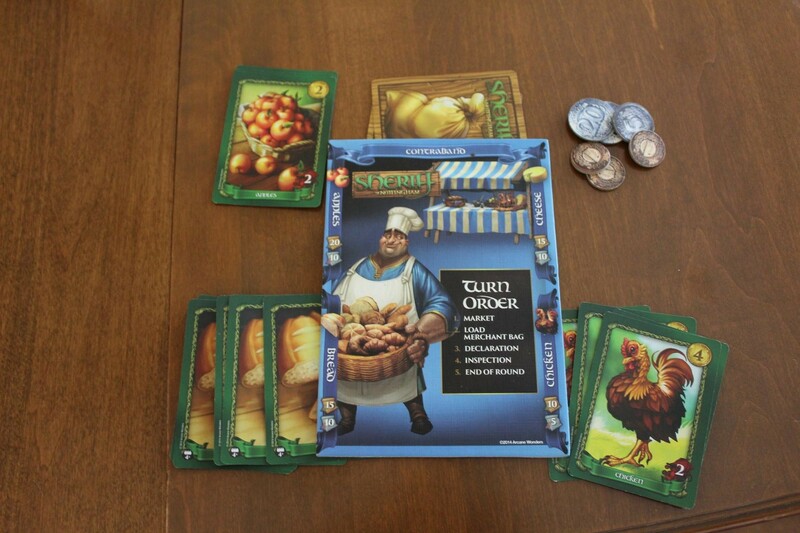 Players will go clockwise starting with the player to the left of the Sheriff going to market. To do so, a player may discard up to five goods from his or her hand and draw that many from either of the face down decks or discard piles. The key here is that if a player wants to draw from discard piles, it must be from the top and before any face-down cards are picked up. You cannot pick up discarded cards after drawing any from the face-down decks. Once the player has chosen their cards, they place their discarded cards into one of the discard piles, in any order. All player will simultaneously and secretly load their merchant bags with strictly 1-to-5 goods. Zero or more than five is against the rules. 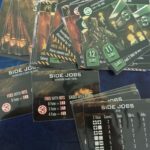 Players will then go in turn order, just like the market phase, declaring to the Sheriff what they have in their bags. This is where they can lie. Even so, there are still some restrictions and rules to be followed. Players must declare only one legal good-type, even if there is a mix. Also, players cannot lie about the total number of cards. Now, the Sheriff gets to have some fun. The Sheriff can choose to inspect, or threaten to inspect, any number of merchant bags. By threatening inspection, the Sheriff can solicit bribes from players. These can have many forms: Gold, goods from your board, promises of future favors, etc. One can even bribe the Sheriff to look at other bags. This can all happen at once, but once the Sheriff makes a decision (by opening a bag, accepting a bribe, or handing the bag back), it is final. Now, if a player’s bag was returned, they will place their goods onto their respective board spaces. Legal goods are placed face up, and contraband face down at the top of their scoring card. These are now in the player’s possesion to be scored at the end of the game, or to be offered as bribes later. If the Sheriff chooses to inspect a bag, there can be two outcomes. If you were telling the truth, you place your goods into you scoring area, and the Sheriff compensates you by paying the total penalty amount of all the goods in the bag. However, if you were caught lying, then you must pay the penalty for every good which you lied about. Penalties for contraband can be quite high. The Sheriff then confiscates the goods lied about and places them onto one of the discard piles. 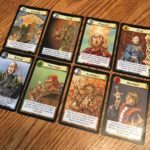 The Sheriff token gets passed to the left, and every player now draws cards from the face-down decks until they have six cards in hand again. 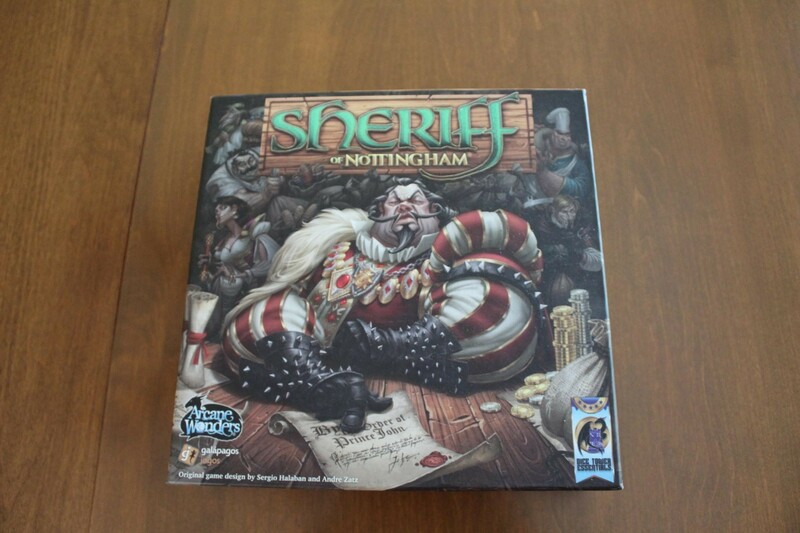 The game ends once every player has been able to play as Sheriff for two rounds. At this point, the player with the highest amount of gold wins. This includes 1) physical gold, 2) the total value of all goods cards that have been accumulated and 3) bonuses for having the 1st and 2nd highest amount of each legal good type. 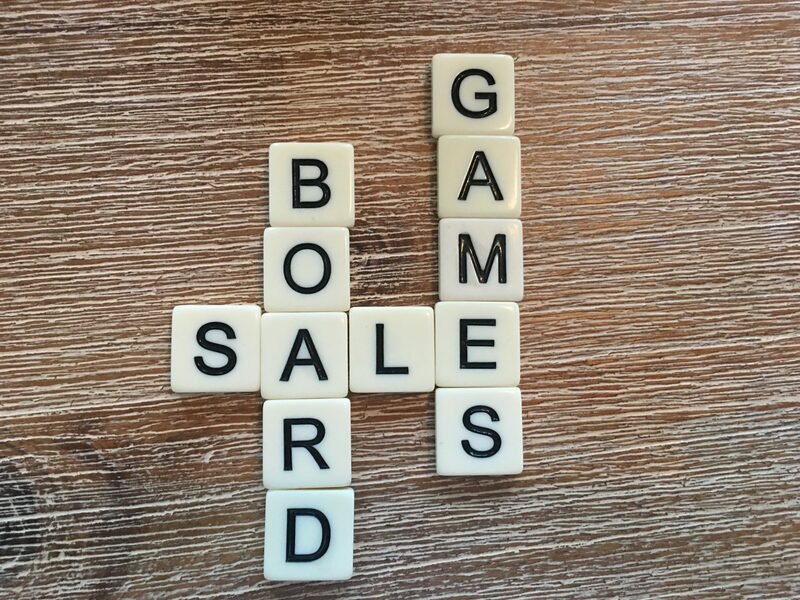 If there is a tie, the player with the most legal goods wins. If there is still a tie, then the player with more contraband wins. The bonuses for scoring highest or second highest in the different goods categories can be game changing. If you want to be playing ‘honestly’ without smuggling goods, you must find a way to obtain at least a couple bonuses, hopefully from the more valuable categories. It can be highly beneficial to watch other players, especially as they go to market, to see if you will be competing for a particular bonus category. At times you can get a big enough lead in a particular category to discourage others from bothering, allowing you to quickly change gears and begin accruing goods for a different bonus. Say however, you want to live a little more dangerously, or perhaps you have such a mix of cards, it’s really not worth trying to go for bonuses. You then give up the honest life and assume that of a smuggler, at least for a time. It can actually be quite the rush filling your bag entirely with contraband and testing your acting abilities under pressure. Surely you aren’t lying when you declare “5 apples”, perhaps the good sheriff even saw you pick them up earlier at the market. Maybe it’s just been a good year for apples, and you had them from the start. Finally, an oft-overlooked strategy is striving to be a good sheriff. Some may argue this is less of a strategy, since everyone gets two rounds at playing sheriff, and it doesn’t actually get you much money. I would disagree. Remember, the goal is to have the highest amount of money relative to others. By obtaining bribes, or better yet catching others smuggling, you both gain money AND they lose some. If you catch them smuggling, you also potentially deny them scoring bonuses if they were lying about different, yet legal, goods in their bags. Paying a little extra attention to your role as Sheriff can go a long way. 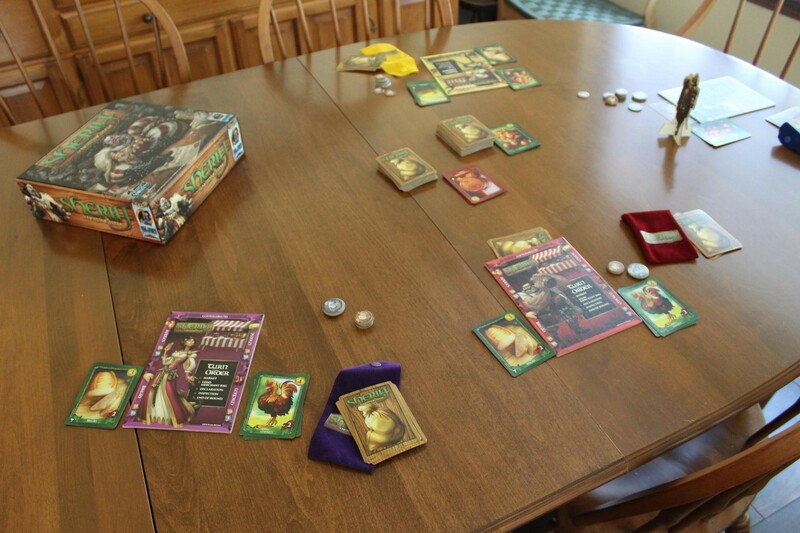 The variety of ways in which you obtain gold is what makes Sheriff of Nottingham flexible and fun. 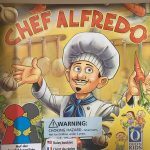 Like many deception-type games, what strategy you choose ultimately depends on the group of people you are playing with and what sort of moods you are all in. The result is a game with high replayability, as you can attempt to play quite differently for many iterations. Honest merchant, stealthy smuggler, or astute lawman, these are all roles you can don and prove yourself with. 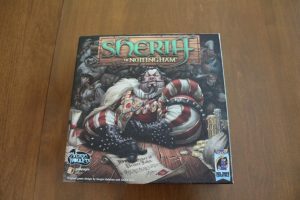 Sheriff of Nottingham is one of my most played games and gets my recommendation, especially for those who have the slightest inclination towards fun mind games and light-hearted deception.